Here's our complete Ni no Kuni 2 guide walkthrough, including how to forge weapons and armor, complete controls and combat guide, as well as how to earn XP and level up quickly. We'll also be going over every Higgledy Stone location in Ni no Kuni 2. The Higgledies are magical friends that’ll help Evan and his comrades throughout their journey in Ni no Kuni 2: Revenant Kingdom. In this complete Ni no Kuni 2 Higgledies guide, we’ll be walking you through how to use these magical companions, as well as naming the best Higgledies abilities for use on the battlefield. 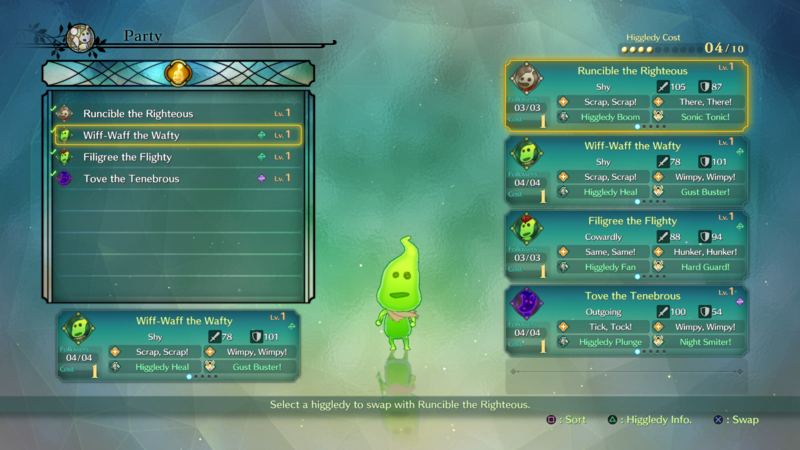 If you instead need anything else on Ni no Kuni 2: Revenant Kingdom, including a complete combat overview guide, as well as a guide on how to get to grips with the top down Skirmish Battles, head over to our Ni no Kuni 2 guides hub. Introduced early on in Ni no Kuni 2, the Higgledies are fairy-like companions that are introduced as allies to Evan, Roland, and Tani while on the battlefield. While you’re engaged in combat, you’ll occasionally see a group of Higgledies of the same color form a circle, and should you step into the circle that they’ve formed and press X, you’ll be able to activate their corresponding ability. Higgledies are broken up into three color-coded categories: green Higgledies are the healing type, white Higgledies are the ones that will summon offensive weaponry, and purple Higgledies are ones that deal in magic. Higgledies are definitely an aspect of combat that can’t be ignored in Ni no Kuni 2, as you’ll be at a significant disadvantage in any battle if you opt not to use them when they present the chance. 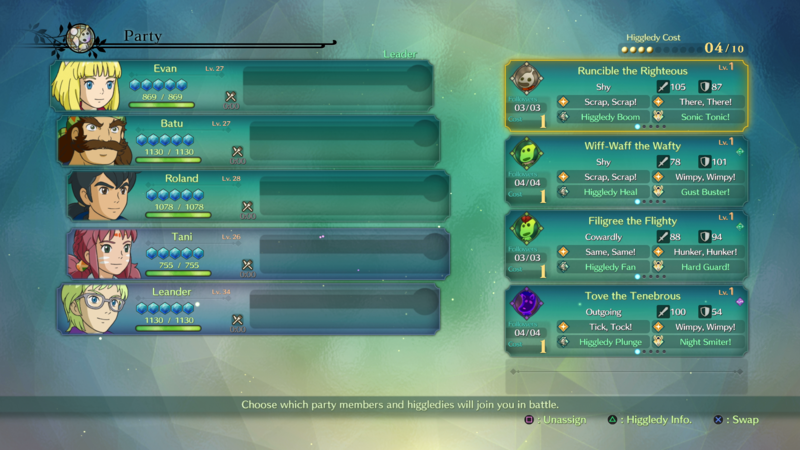 If you hit the touchpad on the Dualshock 4 to pause Ni no Kuni 2 and then head to the ‘Party’ section of the menu, you’ll be able to see all of the Higgledies that you currently have equipped for use on the right side of the screen. Just as you can take Evan and two friends into battle at once, you can take four Higgledies into battle with you, each of which will present you with different abilities should you choose to activate them on the battlefield. Move your cursor over to the Higgledies list and press X, and you’ll find yourself with a list of all the Higgledies that you currently have available. Here, you can scroll through all the Higgledies and take a look at their various abilities. For starters, Runcible the Righteous’ ability to transform himself into a cannon is an excellent ability to use whenever you’re up against a particularly powerful foe, and luckily enough, Runcible is one of the Higgledies that you’ll start off with, meaning you don’t have to search for him. In the Cloudcoil Canyon region of Ni no Kuni 2, you’ll find a Higgledies monument, which looks like a small Higgledy head on the floor, carved out of stone. If you activate this small monument, it’ll ask for a specific item, which is Single Cream. If you give the Single Cream item to the Higgledies monument, it’ll grant you a brand new Higgledy for use in battle, who is named Tove the Tenebrous. Tove is a purple Higgledy, and his main ability is to summon a huge ball of energy onto the battlefield, damaging all who are caught in its eventual blast radius. It’s an excellent ability to use if you’re facing on powerful enemy, or lots of smaller enemies at once, and when you pair Tove with Runcible, they’re an excellent combination of Higgledies to use in any situation. If you want a complete walkthrough of where to go in Ni no Kuni 2 if you want to unlock every Higgledy in the game, make sure to head over to our Ni no Kuni 2 Higgledy Stones guide, for all that and more. We might be all done with our guide on Higgledies, but continue ahead to our Ni no Kuni 2 Kingmaker Trials guide to figure out complex puzzles, or our Ni no Kuni 2 Evermore guide for how to build the perfect town.